I’ve been down to the local health grocery shop near my house yesterday and saw a packet of “Flackers” which I wanted to buy and try. Then my eyes almost popped out when I saw the price. Seriously, 5 small crackers in a small packet costs nearly 10 dollars! So I decided to make one at home. 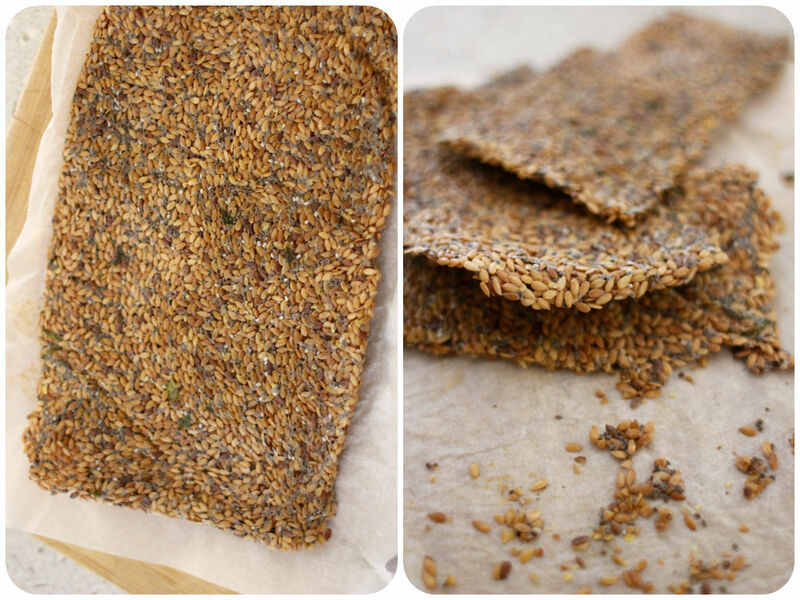 It is surprisingly super easy to make without dehydrator and all you need is just two ingredients. Woohoo, Are you ready? Flaxseed‘s health benefits come from the fact that it’s high in fiber and omega-3 fatty acids, as well as phytochemicals called lignans. One tablespoon of ground flaxseed contains 2 grams of polyunsaturated fatty acids (includes the omega 3s) and 2 grams of dietary fiber and 37 calories. Ground flaxseed is better than whole one because the ground form is easier for your body to digest. Whole flaxseed may pass through your intestine undigested, which means you won’t get all the benefits. Dehydrating is a great way of keeping healthy oils and nutritional properties in raw flaxseed from the high heating. It also creates a nice and crispy texture. Put flaxseed and chia seeds in your food processor and pulse a few times. Season with salt and add water. Let it sit for 20-30 minutes until they all stick together. Pour the mixture on a baking paper and spread evenly with a spatula. Bake in 100 degree oven for about 90 minutes, flipping about halfway. Take it out of the oven and cool it down. Carefully peel off the baking paper and cut into squares. Feel free to add some dried herbs and spices in this recipe to make it more interesting – garlic powder, onion powder, thyme, sesame seeds, tamari, cacao, pumpkin or sunflower seeds, etc.